switch out a type of flour or bread crumb mixture. But eating out is really tough. There aren’t many places that offer sandwich bread that is both gluten-free and Vegan. I’m pretty sure most places are not using gluten-free flours and try getting Chinese food with gluten-free tamari! Not likely. It also means that most prepared Vegan meats are out too. Obviously, seitan is a no-no but so are store-bought tempeh bacon, veggie hot dogs and burgers and any products that contain vital wheat gluten (I miss you Gardein). I had given up most of these anyway since I was eliminating processed foods but I have to admit that I really missed Vegan sausages. They are in my Hoppin’ John recipe, we liked them for breakfast, on pizza and in pasta dishes. 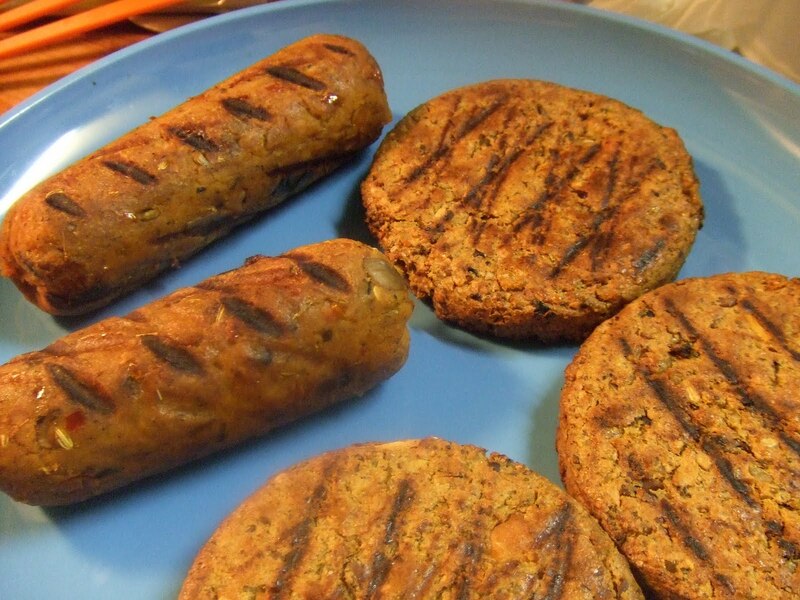 When we go to Woodstock Farm Animal Sanctuary events, they serve delicious grilled Field Roast sausages. It isn’t like we ate them everyday, they were an occasional treat. The problem is that there is no gluten-free alternative available that I am aware of. That meant it was time to make my own. So I researched Vegan sausage recipes and most of them contain vital wheat gluten. That is what gives them that dense texture, that “bite” that you expect from a sausage. 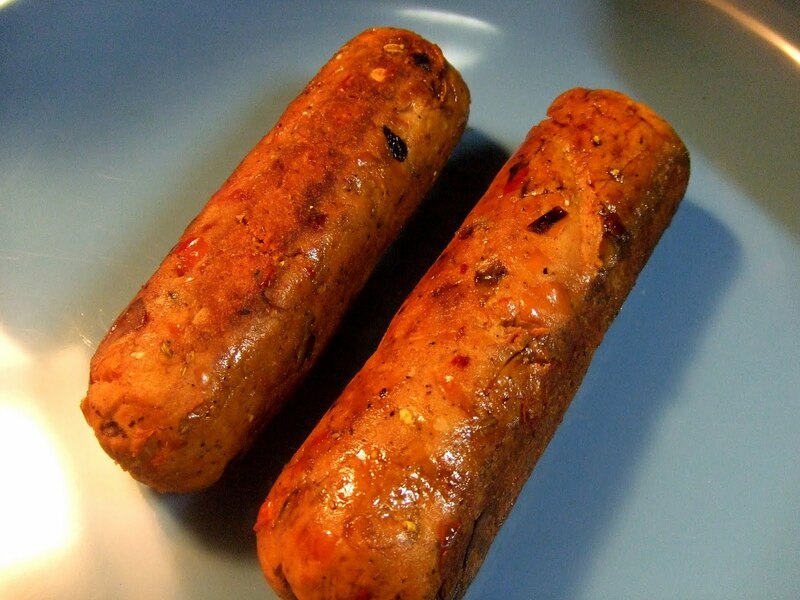 There are recipes out there that don’t use vital wheat gluten but those sausages are more like patties or soft links. You get the flavor but not the texture that would hold up on the grill. On one blog, someone asked if she could make the Vegan sausage recipe without the vital wheat gluten and was told, “No, it wouldn’t work.” Well, that was all I needed to hear (or read). The challenge was ON! I have to admit this is the first recipe I’ve ever posted where I performed multiple tests and trials to get the final product (although I reserve the right to further improve upon it). Usually I make something, it tastes good, I might make a change or two the next time but that’s pretty much it. This time I felt like I was conducting a very important scientific experiment. And I wanted it done in time for summer cookouts. First, I tried making Vegan sausages with lentils since I love them in my Lentil Burgers and Lentil Meatballs. But the flavor of the lentils overpowered the spices. So I moved to different types of beans. In the end, pinto beans were the best choice. They don’t have a lot of flavor on their own so they make a great blank canvas for the spices. Next I had to get the spice mix right. I was going for spicy Italian and that took a few tries to get it the way I liked it. What I learned is that less spice is more. Too many spices and you can’t really taste any of them. Then the most important part: the texture. I went into this knowing that I was NOT going to exactly recreate the texture of a sausage with gluten. That’s important because so many times people try a Vegan version of something and get disappointed because it doesn’t taste EXACTLY like the non-Vegan version. My goal was to create a sausage that would be firm enough to be sliced and that would hold up on a grill. I tried adding brown rice to the mix but didn’t like that. Brown rice flour works much better. I could have used Texturized Vegetable Protein (TVP) but I didn’t want the recipe to have any hard-to-find or processed ingredients in it. The key to getting that firm texture turned out to be Xanthan Gum (which is also used in the gluten-filled sausages found in stores). Xanthan Gum is used as a thickener in baking and gravies. A bag of Xanthan Gum is a bit expensive BUT a little bit goes a very long way so it’s well worth the investment. Finally, after multiple trials, it all came together. The right beans, the right amount of mushrooms, the right flour, the right spice mix and the right amount of Xanthan Gum. 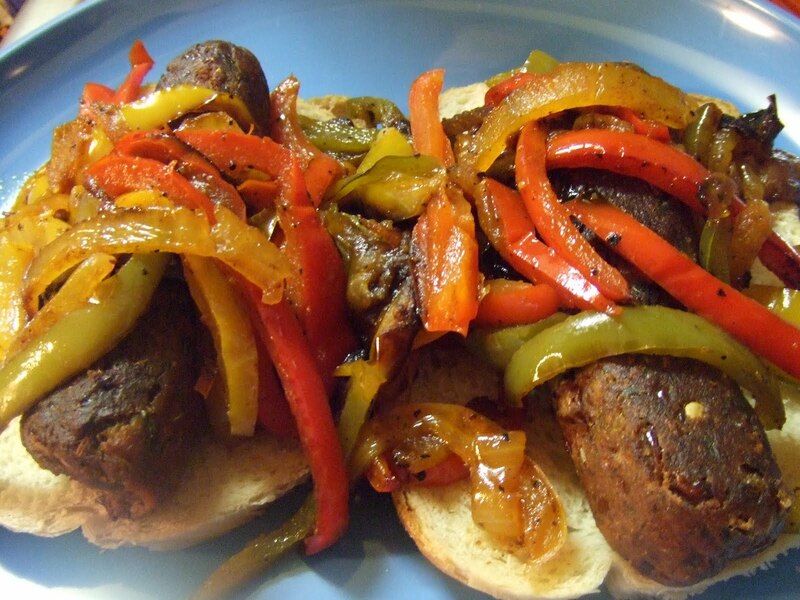 These sausages are delicious and flavorful. They can be grilled, pan-fried, sliced or crumbled. The spice mixture can be changed up to make them sweet Italian rather than spicy or Spanish flavored. Make a double or triple batch and freeze them so you can always have some sausages on hand when you want them. Bring some to your next BBQ or picnic and don’t feel left out when everyone else is eating grilled sausages with peppers and onions. Glorious Gluten-Free Goodness! Heat a skillet with 2 tsp. of olive oil. Saute the onions, mushrooms and garlic until softened. Set aside and let cool. In a large bowl, add the pinto beans and mash them up. You can use a fork, a potato masher or your hands. I prefer to use my hands. If you want to use a food processor, do a rough chop. You don’t want a puree. Then add the tomato paste, nutritional yeast, and brown rice flour. Mix well. Add the cooled veggie mixture to the bowl and mix it into the dry ingredients. Add the tamari and balsamic vinegar to the bowl and mix it all up well. If you are using the Liquid Smoke, add it in now too. Divide the mixture into 4 parts. Shape each part into a log. Wrap the logs individually in foil and steam them for 15-20 minutes. I use a metal steamer that sits atop a large stockpot of boiling water. Then refrigerate for a few hours or overnight, if possible. This will help them firm up even more. When ready to use, unwrap and cook them however you desire. We had them with sauteed bell peppers and onions. Yum! Note: you can also shape the sausage into patties and if desired, cook them right away. Just made these they are in the fridge ready for breakfast tomorrow! I didn’t have brown rice flour so I used Teff so see what happens. Hi. I was just wondering if you could use cornstarch as the thickener instead of xanthan gum. Can you tell me if the fennel is fennel seeds crushed or fresh fennel? I use ground fennel or you can crush the seeds. I doesn’t tolerate mushrooms well and can’t STAND the smell of them cooking. Does anyone have any suggestions for substituting mushrooms in this recipe?? Hi, Can i use chick peas (pois de chiches) instead og beans will it work and still be good ? what happen is i do not put xanthan gum its this be a big mistake ? Xanthan gum is necessary. People who have tried to make these without it or guar gum have had them fall apart. Xanthan gum or guar gum gives you the chew and the structure. I try not to use it much but sometimes you just have to. For patties, I would skip it since they don’t have to be as firm but for links, I say use it. THANK YOU! My husband has really missed his store bought veggie sausages since we switched our kitchen GF after a celiac diagnosis in the family. It was SO nice to be able to produce these sausages and an added bonus that I knew exactly what was in them. They froze and defrosted perfectly too. Next time I will be making a double batch. Yes, you can get red pepper flakes in the UK- same as cayenne pepper flakes. If you can’t find it them simple ground chilli pepper available everywhere will do. This looks so mouth-watering, I don’t know what to say except Thank you, Rhea!!! Can’t wait to try this weekend. Thank you. Make sure you read the updated post (the link is in the original post) because I changed a few ingredients. Thanks for this, btw. I just saw a Julia Child recipe for Braised Sauerkraut and I wanted something “meaty” to go with it and this looks perfect. I buy xanthan gum online from Bob’s Red Mill or amazon. It is expensive but you use teaspoons at a time so it lasts long. I want to experiment with using chia, flax and psyllium as a substitute for the gums. I’m glad it all turned out well and that your husband liked it. I don’t have xanthan gum and no clue where to buy it so I used 6 times as much corn starch and in worked fine. I would suggest poking the veggies until they are not so moist. But if you follow the recipe exactly and don’t leave out any ingredients, it should work. I make them all the time. The food processor should only be used for a rough chop. I usually make these by hand. For the mushrooms and onion, yes I used the processor. Didn’t make it mushy but very fine. Do you cut big chunks? Also, the mushrooms let a lot of juice out! I don’t know. Were the veggies still hot? The mixture should feel firm like when you make burgers or meatballs. Did you use the food processor? If you process too long, it can become mushy. The recipe is a whole can of beans and 1/2 cup of flour plus more if you need it. I tried and it was all good until I needed to mix in the veggie mixture.. then it all got creamy so I’m not sure what to do now 🙁 🙁 add more flour..? Thank you!!! 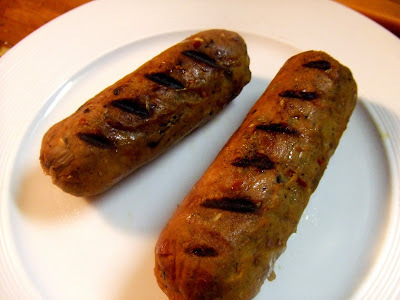 I used to love making soysages from my left over okara, but when I was diagnosed coeliacs, I found the texture was all wrong with the gluten free flours – they still tasted nice but it was more like eating stuffing than the sausage texture I was after and they fell apart too easily!!! These are brilliant!!!! By the way I lined my 3 tier steamer with baking paper (to stop them sticking) and pierced holes in it so they don’t sit in the water and did 2 tiers of ‘sausages’ and 1 tier of ‘meat balls’. Once they are cooked and cooled I lay them on a tray and froze them, then put them in a container so I could pull out as many as I need – the meat balls tasted great with homemade tomato sauce and gluten free fettuccine!!!! 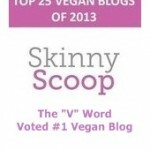 This sounds awesome for those trying to eat less meat and vegans/vegetarians. Thank you for all the comments. Please check out the new and improved recipe for gluten-free sausages that I did this past summer. It’s even better than this one!! Sunflower – the texture of these is close but not exact. The improved version is closer to animal sausage, much closer. Still not as exact as Tofurkey or Field Roast but much closer. I tried your lovely recipe because it sounded promising, and our family has a tradition of smoked sausage for Christmas/New Year’s Eve–usually made with pork shoulder and lovingly smoked for several days. That being said, we have a new generation of many more vegetarians and vegans, but we wanted to include them, so I thought to try this with Slovak spices (read: garlic, caraway and paprika) I haven’t come to the perfect blend of spices yet–this recipe seems to take in SO MUCH spice mix–I was astounded by the amount of garlic, but it was not even noticeable to this Slovak– but I’m experimenting. Thank you for all your work on the original recipe. My meat loving husband thought my first attempt, despite the lack of authentic seasoning for klebasy, was just great. The texture of these sausages is perfect. I imagine they could go anywhere, flavor-wise. Great recipe!! I made these last night, served them up on a bun with some raw sauerkraut and ketchup! Very good! Thank you so much for all your hard work researching !!!! I am so excited to make these!! I just found out that one of soyboy’s veggie hot dogs is gf. Yup, I believe it’s their original one. No wheat gluten at all. Soyboy not dogs. D1, I don’t use a food processor to make my sausages or burgers. I mash the beans either with a fork, a potato masher or by hand. But you could use one so long as it doesn’t turn into a puree. Question: By “mix it up well,” is it meant that one should mash up the beans? Or mix the beans and flours in a food processor? Seems like that direction is missing and it would be good to clarify it. I tried this with the beans–rinsed, drained, mixed up–and realized that I had whole beans with flours all over them. In their whole bean state, they didn’t make much of a shapable substance. I threw them in the food processor. Right? Wrong? Thank you SO much for this recipe. 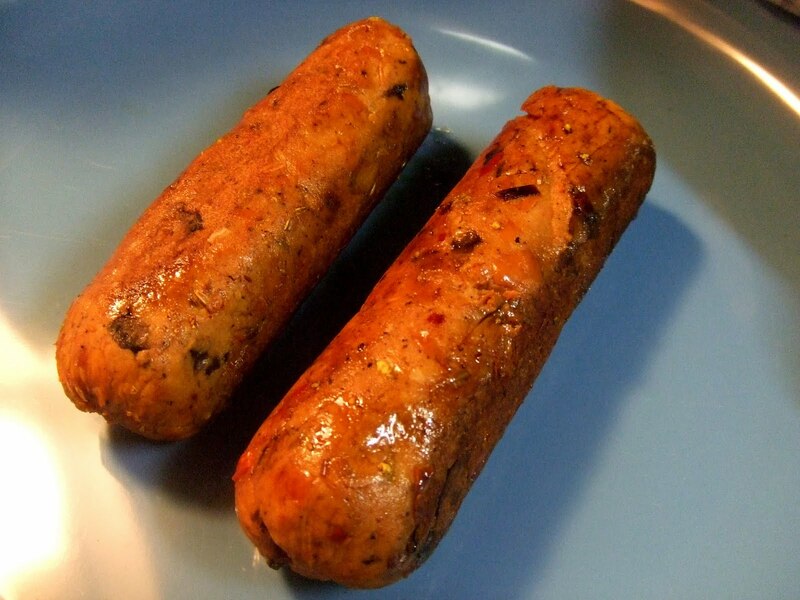 I have celiac disease and had a hard time finding gluten free vegetarian or vegan sausage recipes, and I do sometimes miss sausage. The sausages made with your recipe held together great, although I just ran out of my binding gums and had to use potato flour instead. I really liked the texture and combination of spices, although I will scale down on the pepper flakes next time. Knowing with what little ingredients and at what a low price one can make these, I don’t understand why it’s so difficult to find more recipes or manufactured gluten free meat analogues. Lacie, thank you for letting me know how you liked them. I think mine were more “sticky beanie” than bready. I mean, you could tell they were made of beans and they weren’t going to fool anyone that they were gluteny Tofurky or Field Roast but they were definitely sausage-y. Ha, I think we used all the “-y” words. Whether to use more or less flour is really up to you. Bready might be better than beany. Maybe a drop more xanthan gum instead? Or more mushrooms if you prefer that flavor. You could make some little batches and try them different ways and see which way they taste best. Then make a bunch that way and freeze them because it’s a lot of work!!! I just made these and they are rocking!! can’t thank you enough. i’m usually a gluten goddess, now i’m a gluten free goddess (stole that from the website title)… my daughter is gluten free and breastfeeding so i have to watch what i eat. I added more flour to make them less sticky. should I have? after frying they were a little bready, but i prefer bready over sticky beany , but i’m wondering if i hadn’t added the extra flour what the texture would have been like on the inside. Yes, red pepper flakes is the same as crushed red pepper. Thank you for the comment. Hope you love them! OMG I love you for posting this I cannot wait to tey them. Carol, really? You can’t get red chili pepper flakes there? I’m amazed. There must be some hot pepper spice you can add…IF you want it hot and spicy. Maybe a spice blend or something? Sailirwin, thank you so much. I love you too 🙂 I hope it tastes good. Katy, I look forward to hearing what you think. Skye, I had to try when I read that it “couldn’t” be done without gluten. But if you can make it even better, let me know. If anyone can, you can! You’re blowin my mind Rhea! I thought creating awesome seitan sausages was a task. I’m more than impressed. Glad I have a blog to refer folks to that are gluten intolerant. Sounds great!!! I am excited to try this! Rhea… I think I love you..:) Great recipe and seems lots of work you put in to get the sausage as healthy as possible and still delicious.. Great work..